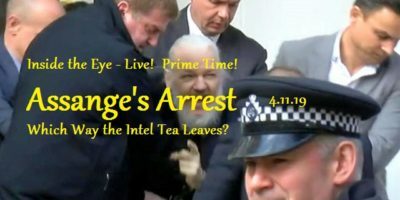 Assange's Arrest - Intel Tea Leaves | Inside the Eye - Live! Leave no doubt about this episode. 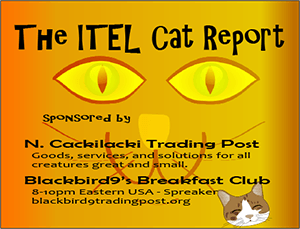 It was a very difficult show to deliver as two days prior, our beloved blind buddy and star of the ITEL Cat Report, Bruiser, passed away after falling from our roof to the ground below. It was not a far fall as far as falls go, especially where cats are concerned, but as fate would have it, the fall proved fatal. Bruiser died in Emily’s arms, although he was already well beyond helping when he was found. He leaves a huge hole in our home as his voice and cries, often tinged with calls of “where are you?”, will sadly be missed. Even worse, the “show must go on”. It would be much easier to go out and hit a baseball, or perhaps slam a basketball, or hammer a nail a bit harder while questioning the seeming unfairness of fate, but such is not the case for those who speak. Our role is to inform and inspire, cause a pause, and bring about perspective and reflection. It is hard to do and while masking sincere sadness. It is just hard to speak. This show bore that out. We began the day with the Julian Assange story and his arrest and ignominious arrest from within the Ecuadorian Embassy. We are not sure of the mechanics. Were the British authorities actually allowed to essentially invade a foreign nation and forcibly remove a Swedish citizen from within Ecuadorian sovereign territory? 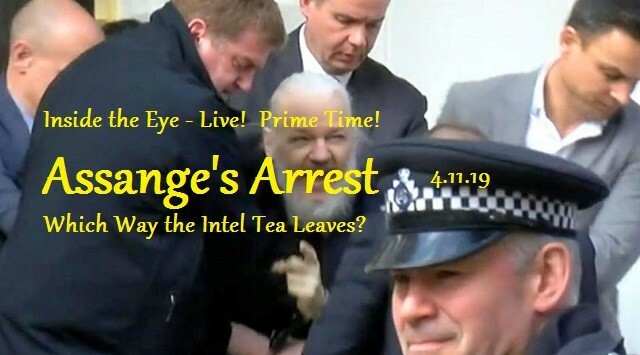 The personage that was Assange looked haggard and aged beyond his years while he was literally dragged and carried away somewhat screaming about how we all “must resist” as he was somewhat thrown into a waiting British police van. Speculation galore surrounded the arrest, from Ecuador’s receiving of a US$4+ billion loan from the IMF to his being whisked away to Washington to be granted immunity so he can testify against the Clinton Crime Syndicate. If the latter be the case, American and British authorities are probably too week to protect Assange. Still, who knows what the future holds? After a bit of “esoteric insight” with “The Fetch’, we launched into a segment about how Jews are creating the justification and precedent for their eventual violent removal from power, and how Germany’s National Socialist government’s removal of Jews, when observed relative to today’s dynamics, were not just wholly justified, but absolutely necessary to the health of the nation. Not a day goes by now without a story of someone being removed from a political position, or a job, or a position of influence due to Jews and their war on anything that THEY deem to be “hateful and anti-Semitic”. What is becoming abundantly clear is that Jews are simply making idiotic and ludicrous statements and using their own declarations and statements as excuses to go after ANYONE whom they deem to be opposed to their rapidly expanding tyrannical rule. Another issue is that of “transparency”. Jews want to use all manner of historical fictions within the past to justify their harming us today, yet they act as if nobody should have a say in their actions. It is rather simple. Jews want to put their hands in everyone’s pockets through fraudulent history but act as if the history they invoke cannot be questioned. JEWS ARE REMOVING EVERYONE THEY DEEM IN OPPOSITION FROM ANY ABILITY TO SPEAK OUT. This behavior goes from the upper echelons of politics all the way down to the anonymous posting personalities on social media. 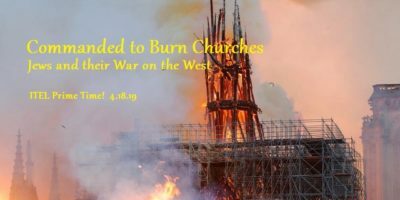 We cannot help but see that Jewish actions are a defacto war on our nations and our national spirit, a spirit rooted in the Magna Carta and the idea of free speech. That Jewish behavior is dangerous to Jews in the long run Jews care not. At present, they have power and believe they can do whatever they wish and will with this power, and if this means sending police to arrest you for innocuous 140 character statements on a social media board in an effort to silence you, then hell be damned, Jews will do it. To this end, some 20 religious groups called on the US Congress to stop weaponizing the term “anti-Semitism”, for weaponized indeed the term is. Weapons may be used for offense and defense, and Jews are clearly on the offense as a means to put up a vigorous defense of their abusive control over our lands.